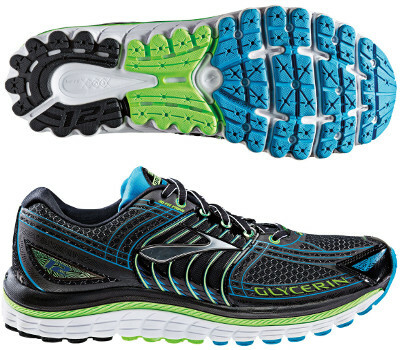 Brooks Glycerin 12 are neutral cushioned running shoes. The Brooks Glycerin 12 is the premium model for neutral runners from Seattle's brand and one of the platforms where Brooks releases new technologies and materials. This new version is about 7,5% lighter than its predecessor the Glycerin 11 and features some of the new components its relative for overpronators the Transcend unveiled some weeks ago like new "Super DNA" midsole which improves cushioning by 20% from previous BioMoGo DNA while still maintaining the same energy return and biodegradable properties. Upper is pretty similar to previous version but reflective elements are gone. Still using 3D-Print to provide a better fit. Outsole has been updated with "Ideal Pressure Zones" to optimize pressure distribution from heel to forefoot for a more efficient and smoother transition from heel to toe. Regarding shape, now is wider in the midfoot and narrower in the heel.